Ralph Waldo Emerson's dementia, an ordeal that marked his final two decades, has never been a secret among those who study Emerson's life. Still, few have focused on the period of Emerson's decline. Thus, his later thinking has succumbed to a process of critical forgetting too often ignored by scholars if not excluded from his oeuvre altogether. And yet Emerson's late output, composed as his patterns of cognition transformed profoundly, stages a reconsideration of interests that had preoccupied him for decades: the continuum of human thought and the rest of nature, the bearing of the individual toward the collective, the mind's relationship with the body. 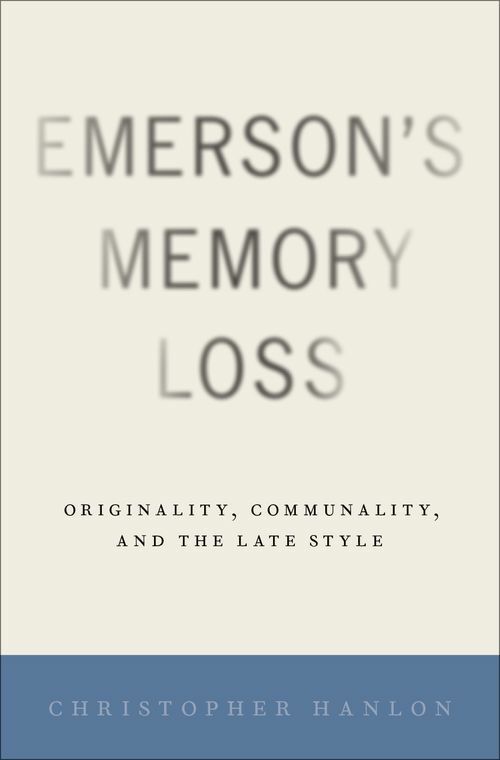 Emerson's Memory Loss presents an archive of texts documenting Emerson's intellectual, affective, and associative states during his late phase, along with the varying forms of shared connection from which these works emerge. It is also about the way such texts connect Emerson with a stream of thought in America, coursing through the works of other nineteenth-century writers and thinkers adjacent to Emerson, that emphasizes the aggregate over the singular, the social over the solipsistic, the engaged over the distant, and the many over the one. Hanlon attends to manuscripts and publications marking Emerson's collaborations with others which Emerson himself articulated as his most important work-texts written even as his ability to do so independently waned. Hanlon measures its resonance across broader strains of U.S. culture familiar to Margaret Fuller, Herman Melville, Walt Whitman, and more.